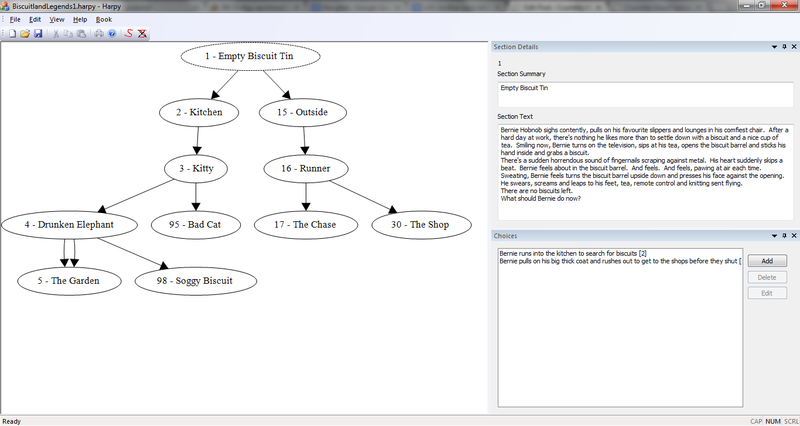 A slight name change later, and we’re happy to give you a sneak preview of GBAT, the GameBook Authoring Tool! In the screenshot, we have loaded in the start of the Bernie Hobnob adventure. Each section is represented by a white disc, along with its number and a short summary. Each line between these sections represents a choice, a “Turn to page…” cliffhanger. Look! It’s so visual! We’re finding this is such a great way to write a Choose-your-own adventure book and can’t wait to share it with you. We’re hoping to have the first version out within a couple of months. Stay close to BiscuitLand and keep updated! Here’s how: follow us on twitter, rss or join the mailing list.